Lighting design transforms your space with vibrant colors. You can choose from wall uplighting, custom image projection, center piece pinspots, and ceiling washes. Paint any room with your chosen color. It will create a stellar backdrop in your pictures. Lighting design is computerized and it will change colors with the mood of your event. Besides your family and friends saying ‘WOW’, even your other vendors will give you tons of compliments. What color are you using to tie together your theme? More vibrant colors will give you better results. Color that is high in saturation always has the best effect. This includes bright oranges, soft blues, deep pinks, and lime greens. A popular solution we do for clients all the time is wall uplighting. We create this effect by positioning LED lights at the base of your walls around the perimeter of your venue. During dinner and cocktail hour, your room will match your chosen color or can slowly change between colors. We can even stagger fixtures to coordinate with a primary and secondary color pallet. During the upbeat moments, your lighting will change colors with the beat of the music. Example, if we play Lady in Red your entire room is red, if we play Usher – Yea, your area is green like the music video. Colored fabric is a classic way to make-over the feel of any function. If you want a picture perfect backdrop, then incorporate it into the design of your room. 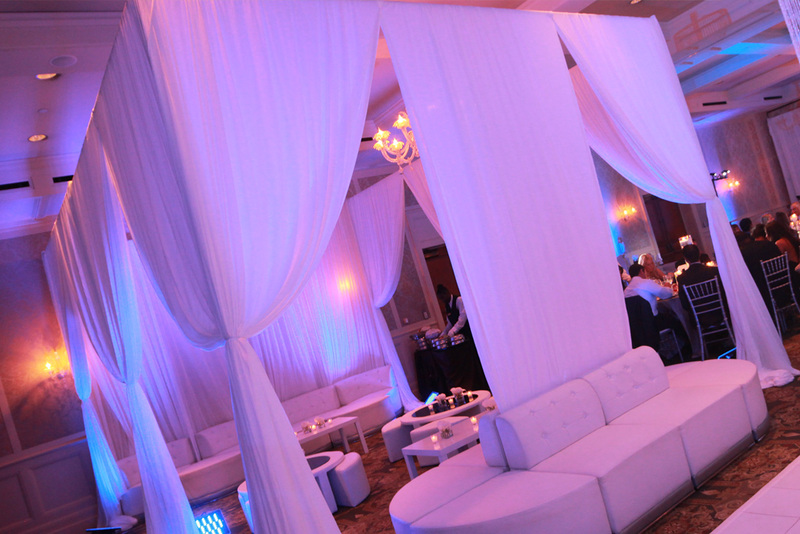 Pipe and drape is also used to produce a blank canvas when your lighting choices are limited. Two scenarios when this is needed is for venues that have stained wood or darker paint. We all know there are some places that have not so pleasing wall paper or paint. Drapery is an efficient way to cover those ugly walls so guests won’t notice. You can even build divided rooms with pipe & drape. Some people use this to mark entrance ways and lounge spots. When using fixtures to light pipe and drapery, it’s always best to use a lighter pastel color for the cloth. This will make your colors more noticeable on your backdrops. Event trees are an Encore original. Oh yea, we just went there… you can have actual trees setup in strategic areas at your next celebration. They are extremely useful for creating an environment that is both beautiful and diverse. Lighting is the best way to accent event trees for a balanced look guest will appreciate. Since lighting is computerized, we can work with a wide pallet of colors to ensure that we tie together the theme of your party. This is the ultimate way to focus the attention of your event in a fun yet completely different way. Also consider hanging crystal bead strand, giant pine-cones, mossy green, or tying colored ribbons to branches. Those of are just some of the many ways you can ensure guests will leave your event saying, “WOW”… Click any of the (3) photos above to make the smaller sample images larger. Are you looking for an old world vibe at your event? Bistro light strands give a fun way to light your venue. These can be strung in tents, outdoor settings, or across balconies. Our light strands have dimming capabilities allowing you to control their brightness. Click any of the 5 photos above to enlarge the sample images. What will guests say when they notice your centerpieces? Centerpieces give your room more focus and pin spotting your tables makes them come to life. 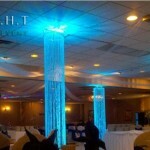 We aim high intensity LED fixtures at your centerpieces and make them really shine. Some clients add crystal bead strands to make their entire space shimmer like stars. You can arrange the beads on branches in tall vases so the crystals can capture and reflect the pin-spot. To recreate this amazing effect, all you need is (1) lighting fixture per table. Trust us, your family and friends will appreciate all the time you’ve put into designing your centerpieces. Ceiling washes are great at topping off your space and keeping it well balanced in color. The effect usually make sense to do in halls that have either vaulted ceilings our tented canopies. The higher your ceiling the more your colors will blend evenly. Most of our ceiling washes are done in a secondary color to compliment a primary color (video sample below light pink ceiling with teal walls). Fixtures are controlled by a computer program, so your ceiling can change as your evening does. Since we use intelligent moving head fixtures, ceiling washes can also act as a follow-spot for grand entrances and special dances.